Everything but the sand! Let us take your party to a coastal oasis with this chic (and a splash of nautical) design. 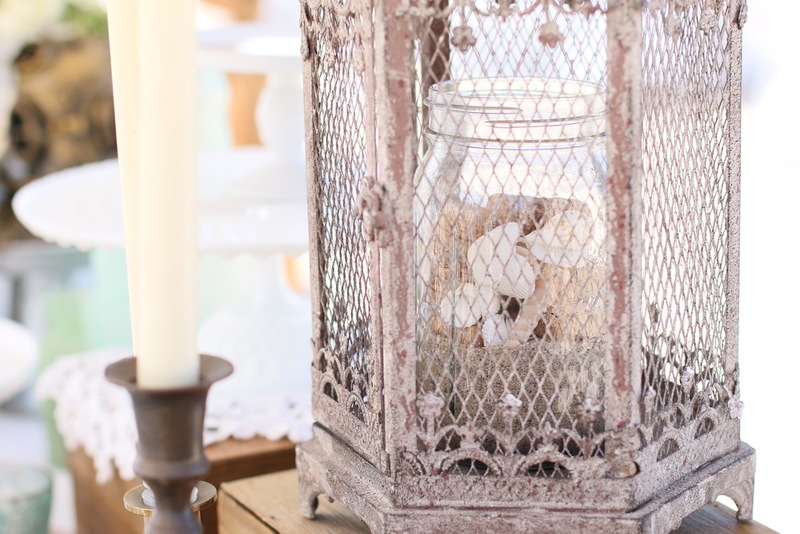 Soft lace linens over worn wood pallet tables are just the first layers of luxe, each adorned with an array of shells, sea glass bottles, votives, "driftwood", and a soft pallet of pre-arranged faux flowers. You will be hearing waves of delight from all of your guests! Check out what can be included in this collection here, and don't miss our additional add-ons below to help make planning your party as seamless as possible. Whether it's a small gathering or big, and whether you want to DIY or have your event setup by our designers, we have a package for you. A beautiful appetizer or dessert display equipped with white and galvanized metal platters, vintage lanterns, driftwood accents, sea glass bottles, vintage wooden crate, and a soft pallet of pre-arranged faux flowers. An assortment of white and galvanized metal cake platters and serving trays for your food or desserts. 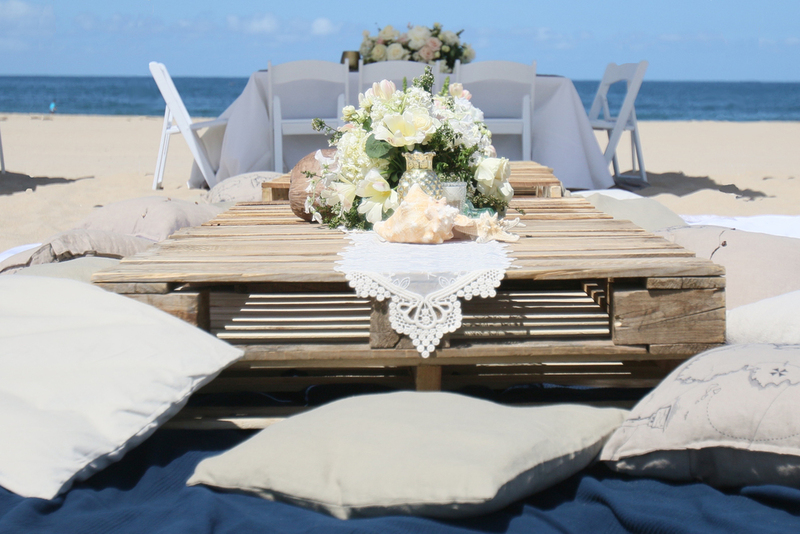 Beach inspired table decor including lace table cloths or runners, coconuts, seashells, "driftwood", sea glass bottles, votives, and gold coral or pineapple accents. Also comes with a beautiful soft pallet of pre-arranged faux florals. Low tables for dining made out of stacked reclaimed wood pallets. Assorted blankets, tapestries, & pillows for a chic yet comfortable event experience. 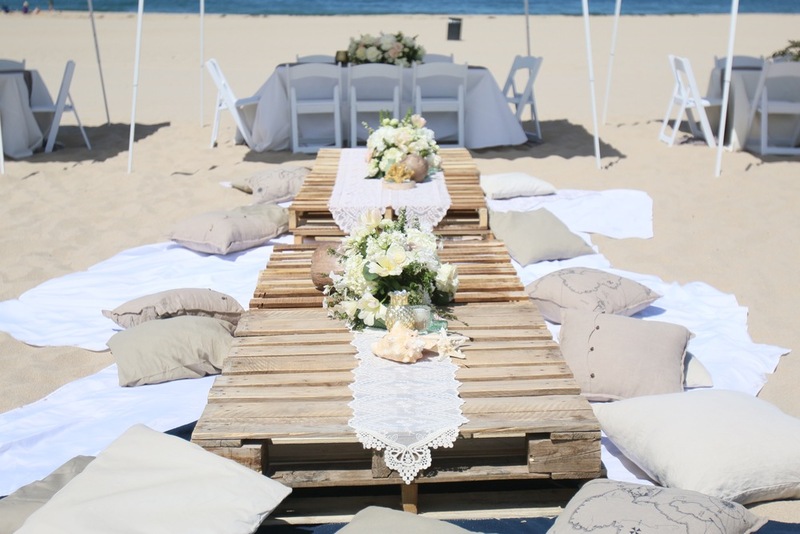 In case there are any guests that may not be comfortable on the floor, you have the option to dress a dining table with ivory linens, a chiffon table runner, faux florals, and beach decor. Disposable eco-friendly dinnerware including plates, salad plates, and cutlery upon request. Along with the low pallet tables, we have an option for low wooden tables with lace tablecloths (seats 10-12). Event setup and picture-perfect designer installation so you can focus on your other hostess duties! Event setup will be executed by trusted designers.